Oop. That was quick, wasn't it? 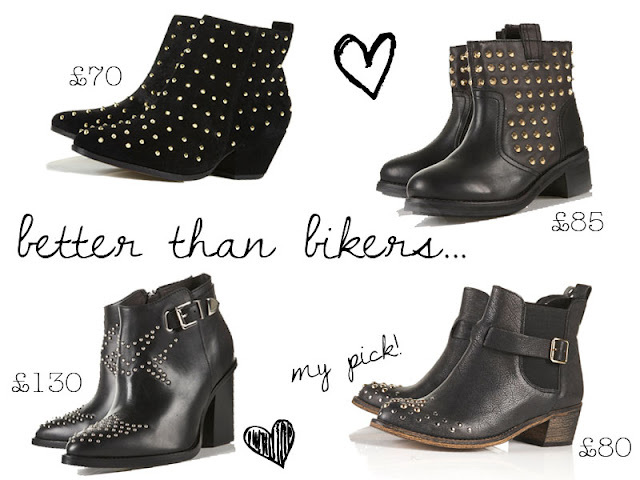 I would happily welcome any of these studded boots to my wardrobe, particularly the £70 and the £80 pair. I'm a woman obsessed with studs and all these boots are just tempting my inner magpie and urging me to reach for my purse. If you see me in Topshop with more than one pair, please do stop me, remind me that I need money to live, not just wear nice boots. Priorities, Shona, priorities. I would wear these with everything from jeans to my new favourite lacy dress and they are all so lovely and practical. Not ideal for airport security but (BOO HOO) i've done all my international travelling for this year, so that doesn't bother me! I'm currently on a clothing ban (no. more. clothes. ), but I can still buy a pair of winter boots, right?